Investment is coming and supply and demand are increasing but some degree of change seems likely in Vietnam's steel industry. NS BlueScope Lysaght Vietnam, a member of Australia’s BlueScope Steel, last month opened a new factory at the Quat Dong Industrial Zone in Hanoi’s Thuong Tin district as part of its new development strategy focusing on expanding its market in the country’s north. “We consider the northern market, with two major cities and large industrial zones, to be a market of potential for our high-quality construction solutions,” said Mr. Nguyen Cao Tri, President of NS BlueScope Lysaght Vietnam. He added that the company decided to promote its business in the north in the expectation that its unique solutions would be present in more buildings and therefore change the face of the construction industry. As Vietnam’s economy develops and living standards rise, demand for steel among industries is increasing and the Australian company’s expansion plans will better serve market needs. According to the Vietnam’s Steel Industry, 2018-2022, report from Research and Markets and released in May, there is huge potential not only in Vietnam’s steel market but also in other Southeast Asian countries’, and investment has grown steadily for a number of years. The report revealed that there are more than 100 companies in Vietnam’s steel industry, with the larger including Hoa Phat Steel, Hoa Sen Steel, the Vietnam Steel Corporation, the SMC Steel Company, and the VSC - Posco Steel Corporation (VPS). The biggest investment came from the Formosa Ha Tinh Steel Corporation (FHS), a joint venture between the Formosa Plastic Group, the China Steel Corporation, and Japan’s JFE Holdings, with first-phase investment of more than $10 billion. The Ministry of Industry and Trade has forecast that the industry’s growth of 20 per cent this year will be maintained, with construction steel up 10 per cent, cold rolled coil 5 per cent, straight welded steel pipes 15 per cent, and galvanized iron sheet and color coated paint 12 per cent. 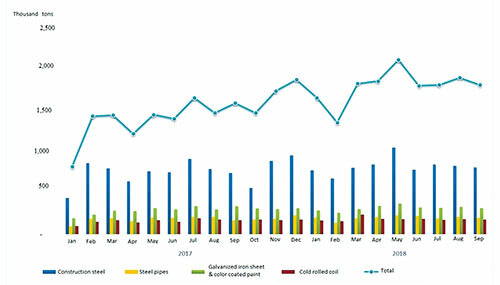 Hot rolled coil (HRC) is expected to see the strongest growth, of up to 154 per cent. A series of iron and steel projects will be put into operation this year and next, such as the Hoa Phat Group’s steel complex in central Quang Ngai province with a total capacity of 2 million tons per year, the Hoa Sen Group’s cold rolled steel production line in south-central Binh Dinh province with a capacity of 350,000 tons per year, and three construction steel projects belonging to Pomina, Vietnam-Italia, and Tung Ho, which will produce over 1.8 million tons a year. The central province of Quang Tri last month licensed the local Viet Quang Limited Company to build a stainless steel plant with total investment of $60 million. Located at the South East Industrial Park, the plant will occupy 31 ha with construction to commence in the first quarter of 2019. China, the world’s largest steel exporter, has seen exports stall due to protectionism in the US, Canada, Turkey, Malaysia, Thailand, and Indonesia. Part of its steel output may become redundant and local manufacturers will try to export more to Vietnam, with an oversupply continuing in the latter for the next three years. China significantly influences the local steel industry due to its proximity and prominence as a large-scale steel producer, according to Mr. Stefano Marelli, Regional Global Sales Manager for South East Asia at Tenova Metals. “We have to consider that Vietnam has been the first country in the region to be affected by the anti-circumvention duties imposed by the US on its export of cold-rolled and corrosion resistant steels, as these are produced from input material of Chinese origin,” he said. Imports still counted $8.8 billion in 2017, a considerably higher value compared to export turnover of $3.3 billion, he added, and Vietnam runs the risk of becoming a consumption market for imported steel products. Due to the recent changes in the business environment, Mitsui & Co. Vietnam Ltd. is concentrating its efforts on developing and expanding its domestic business. “Our strategy for cutting into the largest steel market within the ASEAN region is to provide value added services through the development of effective supply chains and business innovation with local partners using digital technologies,” Mr. Hideki Jindo, General Manager of Steel Products Business Department, told VET. PEB Steel Buildings Co., LTD., meanwhile, has fared better than most. Its Vietnamese steel mills, which usually export around $3 billion worth of galvanized and coated steel to ASEAN and other markets (including the US), were affected by protectionism in ASEAN and the US and had to reduce prices to sell more domestically, according to Executive Chairman Mr. Sami Kteily. “We benefited from that, as prices for the raw materials needed went down slightly,” he said. “The protectionism has been mild on our business and if anything has been favorable.” Chinese steel exports to the US are now only 3 per cent of the latter’s imports, and the appearance of 600,000 tons of mainly black steel destined for the US pushed prices down slightly, he added. The VSA has called on the State to continue with trade defense measures and to ensure that rolled coils used in construction projects under the guise of other types of steel were taxed accordingly. Thanks to efforts made, Vietnam’s dependence on Chinese steel has been eased to some extent. Figures from the General Department of Customs show that Vietnam exported iron and steel worth $3.15 billion last year, up 36 per cent in volume and 55 per cent in value from 2016. Imports of Chinese steel fell, from 60 per cent of the total in 2016 to 40 per cent, and are forecast at 38 per cent this year. The association is continuing to monitor global steel issues and is cooperating with local governments and businesses to adopt a timely response. Mr. Sua suggested domestic firms invest in technological advances, improve their governance capacity to increase competitiveness, and study international practices if they wish to compete into the future. Hoa Phat Steel has recognized the great potential the southern market holds, as it generates nearly half of the country’s GDP and has consistently strong FDI inflows. Industry insiders believe it will increase its market share in the south once its Quang Ngai complex opens in 2020, producing 1 million tons of high-quality long steel and 2 million tons of HRC. The Hoa Sen Group, meanwhile, partnered with FHS last month to purchase HRC amid fierce competition and changes. The deal is expected to improve the group’s financial situation by 2019, on the back of a handy increase in the HRC import price. At the same time, it will avoid any other anti-dumping duties imposed in the US. For many years now the construction sector has been the destination of most steel produced in Vietnam, according to Mr. Marelli. 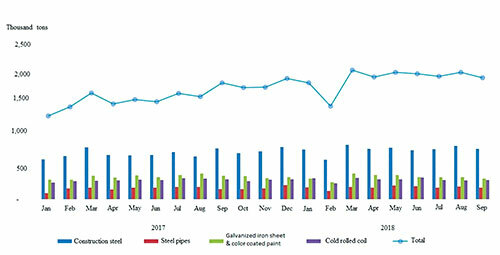 In recent years, steel production with higher added value (like coated steel) has increased considerably. New investments, though, have been put on hold due to trade tensions and the consequent uncertainty. “We think Vietnam should invest in the production of high-end products, like steel for home appliances or the automotive sector, to differentiate its production from Chinese imports, which account for the 45 per cent of all steel imports,” he said. Steel for home appliances and the automotive sector will indeed increase over the next few years, as will the related production of alloy-steel and high-quality flat steel, he added. The automotive sector is now developing strongly in Vietnam and could also have an impact on the metals sector. Mr. Hideki Jindo, General Manager of the Steel Products Business Department, Mitsui & Co. Vietnam Ltd.
Mr Sami Kteily, Executive Chairman, PEB Steel Buildings Co., LTD.